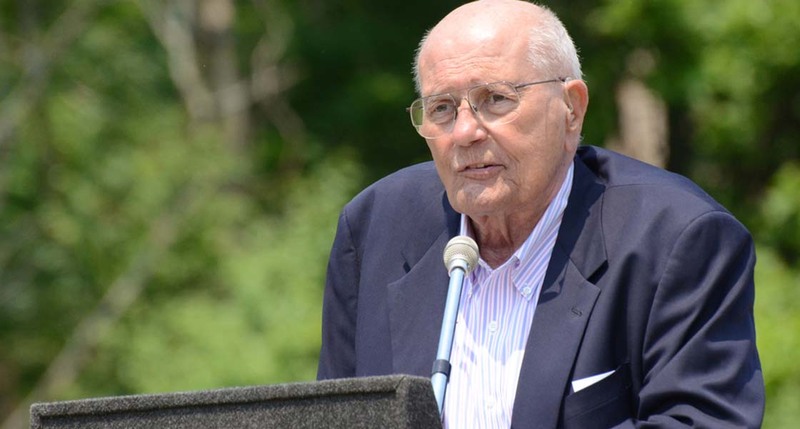 News that John Dingell passed away Thursday after a long battle with cancer was both saddening and victorious. There are very few people who can legitimately be called a legend in their own lifetimes. John is certainly one. Always representing Southeastern Michigan, he served 59 years in the U.S. House of Representatives – a record of service unmatched in American history. At 6-feet 3-inches, with piercing eyes, a booming voice and a powerful persona, he was a force of nature … once experienced, never forgotten. I first met him back in early 1965, when I was administrative assistant for a congressman from Kalamazoo, Paul H. Todd, Jr. The event was a fundraiser for newly elected freshmen in the historic Cannon House Office Building on Independence Avenue in Washington. There must have been 100 people crowded into that room, and when Big John walked in, it was as though Moses was parting the Red Sea waters. By that time, he had served for 10 years since his election in 1955, when he succeeded his father (who himself served 22 years!). He was already more than slightly larger than life. John talked the talk and he walked the walk. His colleagues elected him chair of the House Energy and Commerce Committee in 2007. Under his leadership, the committee seized jurisdiction over an astonishing range of topics and made John Dingell one of the four or five most powerful members of the House of Representatives. He made life hell for those called to testify in front of his committee. He required they be sworn in – to deter false testimony. He had a top-quality staff of investigators sniffing out bad stuff. And he was remorseless, and his letters of “inquiry” were ferocious and regarded with terror by offending bureaucrats and various malefactors. At the beginning of every session he introduced the same legislation his father had championed – to create a national health care system. He always regarded the passage of the Affordable Care Act as much as a family commitment to the people of his country as an important achievement of public policy. Year after year, his constituents returned him to office, usually capturing 60 to 70 percent of vote or more, a remarkable record for any congressional district. Of course, his opponents tried to play redistricting games to get him out of office. In 2002, the Republican-dominated state legislature added a chunk of Washtenaw County to his downriver district, complete with a sitting Democratic Congresswoman, Lynn Rivers. A tough primary election threatened. John called me. “So what’s all this stuff about the ultra-liberals in the People’s Republic of Ann Arbor (as it was then known) going after me?” he asked. It didn’t take long for to a bunch of local Democratic (and Republican!) leaders to organize a “friendraiser” for John. He easily won the primary. After he decided to retire from the House, his wife, “the lovely Deborah”, as he called her, succeeded him after the 2014 election and still serves in the Congress. At the top of this column, I called John Dingell’s death both sad and victorious. Sad for obvious reasons. Victorious because we who were lucky enough to be represented by him had the extraordinary experience of knowing and admiring one of the giants of American governance. And America is a better place because he was there. He stood foursquare for “the nobility of public service itself.” In his career and in his person, John Dingell was always victorious. We’re unlikely to see his like again. I think Rep. Dingell was wrong about "...the complete collapse in respect for virtually every institution of government.." It isn't the institutions that are no longer respected; it's the self-serving SOBs who with near unanimity occupy the offices of those institutions. There's no need to launch a lengthy litany supporting that supposition; regular readers know what I'm talking about. I disagree with your assessment that nearly everyone in government is a "self-serving SOB." Of the Michigan delegation in Congress, I am acquainted with Gary Peters, Debbie Stabenow, Elissa Slotkin and the aforementioned Deborah Dingell, all good people. At the state and local level, it is my observation that most officeholders are honorable people. I'd say the problem is as much with the electorate as it is with those they put in office. With all due respect Phil, is this something we really want from democratic representation? A person sitting in this same office for 59 years?? We can debate term limits and the length allowed ... but 59 years?? On top of replacing his father and being replaced by his wife ... isn't that a monarchy? Fine column, Phil. On another site, I just read John's final statement to the country, describing his concerns for our democracy. It is well worth reading.